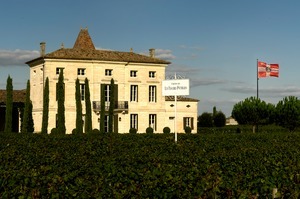 The vineyard is made up of three parcels on the plateau of Pomerol with altitudes averaging 33 to 38 meters above sea level. The pebbly soils from the northern parcel yield a wine of great elegance with notes of black cherries. The center plot, known for its summer heat (the area is called “Tropchaud”), produces a wine of tremendous suppleness with a hint of plum. Wine from the southern parcel is particularly velvety, dense, structured, with a pronounced nose of blackcurrant. Blended, these three singular terroirs with nuanced and complementary characteristics produce a generous, expressive wine with apparent structure and a dominance of black fruit. An attentive tasting reveals remarkable refinement, complexity, and a touch of violet.